The information-resource centre in KSU named after Berdakh was created on the basis of library of Teacher’s institute (1934) which had about 3000 copies of books, and two employees, and NSU libraries of (1976) where there were 240000 copies of books 24employees. According to the resolution of the President of Republic Uzbekistan №381 of June, 20th, 2006 «On the organisation of information-library maintenance of the population of the Republic», standard documents have been developed, and library KSU has been reorganized to the centre of information resources № 1-2. The information-resource centre consists of 6 departments. Department of a scientific methodology. Department of reception of literature, gathering and catalogue. Department of marketing and information service. Department of the literature and electronic information resources. In the centre there are 10 reading rooms intended for 650 readers: students, magistrants, doctors, and professorial teaching staff who need necessary literature. 503395 copies of the literature are kept in the information-resource centre: 323062 educational grants and textbooks, 695 copies of invaluable literature and about 5000 copies of foreign literature. Daily the library fund is replenished with new books, newspapers and magazines. Now in the information-resource centre there is an electronic fund which meets information needs and interests of students. For acquaintance professorial teaching staff and students with new books exhibitions of books, presentations of books, bibliographic data, seminars, scientific conferences are held, etc. 24107 copies of electronic resources, 2802 texts of e-lectures made by teachers are brought for storage , electronic reading hall for storage, 7238 electronic versions of lecture texts are recorded on CD disks . Monthly textbooks and methodical grants, the texts of lectures prepared by the professorial teaching staff of university are placed in an information network «ZiyoNet» . 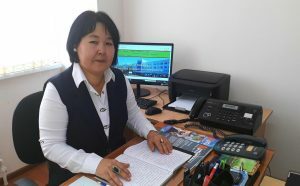 The employees of the library Naurizbaeva , Mambetnazarova Т, G.Abdreimova, G.Matakova, Khalmurzaeva P, E.Turganov, D.Esengeldiev, A.Aluchievlard make a big contribution to the library enrichment, and Khalmurzaeva at high educational instiutions and secondary specialized educational institutions, hold seminars-trainings at the resource centre, give methodical and practical help. The information-resource centre is provided by 61 computers, the printers, copying devices, the video recorder, the musical centre and TVs which are connected to an Internet network.